Take chopped watermelon, remove seeds and mix it in the mixture. Put diced watermelon in the refrigerator. Take a pan, add watermelon puree, 2 glass of water, peas and cook it for about 5-6 minutes. Add spring onions, salt, oregano and cook it for 2 more minutes. 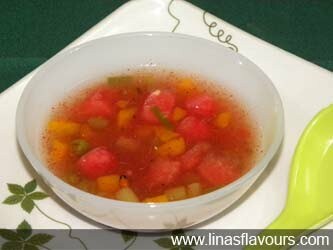 Before serving add vinegar, chilled watermelon and serve it hot.